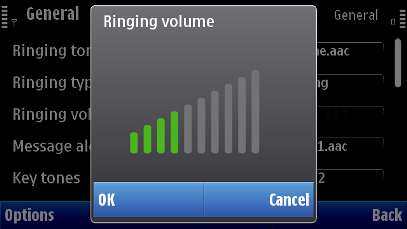 Volume setting item is used for controlling the volume setting on the mobile device. It is a general purpose component and does not directly control device volume. The focused value is the new volume level. Tactile: Sensitive slider effect and audio feedback are provided with touch down event. Changes the slider value along with the touch event. The slider control area is the entire main pane area. Touch down on slider, moving and touch release are performed in the slider control area, without releasing the touch event. Tactile: Sensitive slider effect and audio given tied to the steps, if there is more than 15 steps then smooth slider effect (no audio) is given instead. The value of the slider is where it was when the touch left the control area. Touch is moved out from the slider area, without releasing it. If the user drags the touch out of the slider area, and back, the value will continue to move along with the touch action. Tactile: No touch release feedback given if it is performed outside slider.